You have filled out our form, made your payment now, get ready to train your dog! First night is without your dog! Why? because we are going to teach you how to bring your dogs in safely and peacefully. Also we will teach you about rewards and what you need to bring. No matter what time or day your class is, we all get oriented together... at one time. Bring proof of vaccinations. Orientation will be held at 7PM at the Berks County 4H Community Center, 1238 County Road, Leesport, PA 19533-9707. The building is located behind the Berks County Agricultural Center in Bern Township. At orientation we will explain our training techniques and what you can expect from your classes. PARKING will be in the large stone lot behind the 4H building; the entrance is at the opposite end of the building. Acclimate your dog to the car. Lots of very short rides to a fun place. Down the block to a park or just down the block to a walk. He needs to learn to look out the window to avoid nausea. ​Sometimes, for very fearful dogs feeding them dinner in the car - first with the car turned off then later with the car running* helps them over come their issues. Your vet may recommend and anti nausea pill. * don't leave the car running for more than a minute or two. EQUIPMENT you need for class include your training collar (which can be buckle or flat, slip or martingale collar) and a 6-ft cotton or leather leash (no flexi leashes). You should bring plenty of treats (at least 2 kinds of SOFT treats) and a towel or small rug. If you are using a slip collar for training do not put it on your dog until you arrive at class. You can purchase a slip collar and leash at the club your first night of training. Bring a dish and water on a warm evening. Our classes use reward based techniques and focus on dog friendly training methods. If you have a question about a piece of equipment not mentioned here please ask your instructor. 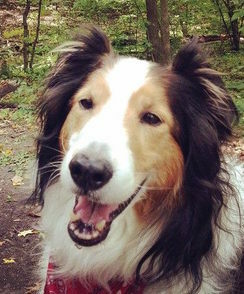 ​Our objective is to help you develop a relationship with your dog built on trust and cooperation. You will teach your dog good manners, solve behavior problems using positive reinforcement and reinforce the things your dog is doing right creating enthusiasm for training. At home, keep your training sessions short, about 15 minutes, and interesting. Training a number of times a day with short, fun and rewarding lessons keeps your dog excited about training. Parking will be in the large stone lot behind the 4H building; the entrance is at the opposite end of the building WHICH GIVES YOUR DOG PLENTY OF TIME TO RELIEVE HIMSELF. When walking from the parking lot to the building entrance, KEEP DOGS OFF the grassy area adjacent to the building. Potty your dog across the driveway from the building. Bring bags to clean up after your own dog! A bucket to dispose of waste will be provided. ALL WASTE STAYS OUTSIDE. In case of inclement weather, your instructor will contact you or you can call the club phone for last minute cancellations. If you have any questions call the club phone at 610-670-7009. Or use the contact form on this website. * When we cancel for dangerous driving conditions or other events, the class will be made up. We build in a few snow days for our January classes at the end. And, when outdoors, we build in some thunderstorm makeup dates. So Orientation is without dogs no matter what the date!